Are you ready to "Fight the Good Fight?" If you are, then this book is for you. 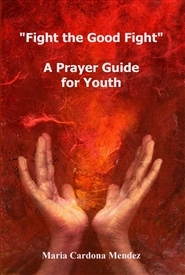 In it you will find five simple steps to begin praying. You will learn to Worship God and pray for you and others. Prayer fills our emptiness, brings solutions to our problems, changes our world and our families, takes us out of the depths of despair, to the shining and glorious light of our Lord Jesus Christ. All battles are won through prayer!